Beat your heart out at this weekly drumming hour at Joe's Beerhouse! Researchers have found that drumming helps reduce anger and tension, is therapeutic and improves anyone’s sense of wellbeing. Just grab a drum and join the fun, every Wednesday at Joe’s. Starting punctually at 6pm our drum circle is led by one of our drumming facilitators and a back-up team of a djembe and bass drum player each. Each facilitator has his own style of leading, so your experience might be different from week to week. We will provide small to medium sized djembe drums for everyone to participate. If you have your own drum, bring it along. 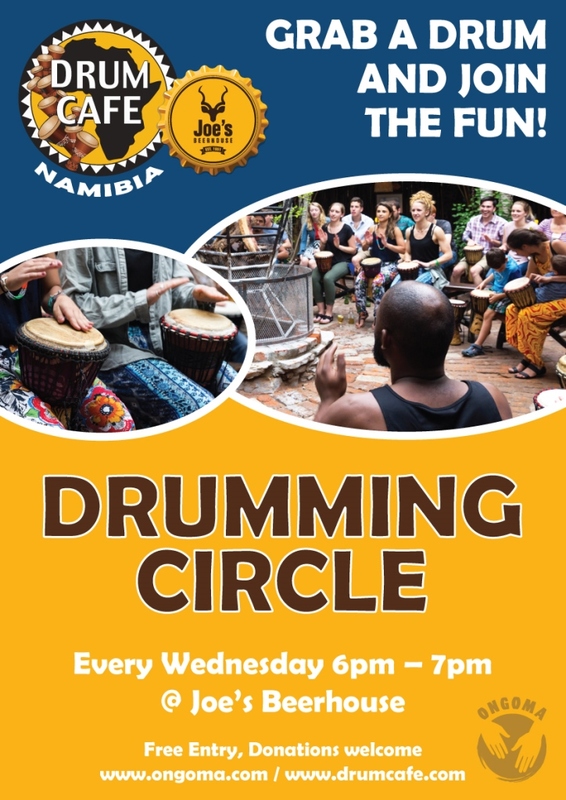 This weekly drum circle was recently declared as "one of 25-MUST-HAVE-Experiences in Windhoek" by The Namibian's columnist Martha Mukaiwa! Free Entry. We appreciate donations and suggest a participation fee of N$ 50 pp, N$ 20 for kids.